Tis the time of year for tailgate parties, football games, turning leaves and cool evenings. Fall is all around us and if you are a football fan or college sports fan, you too can show your team spirit in a way that will allow you to enjoy these cool evenings, enjoy the season, even tailgate at home with friends before, during or after the game. These Collegiate Fire Pits are a must see! You can even cook your hotdogs on the included cooking grate. 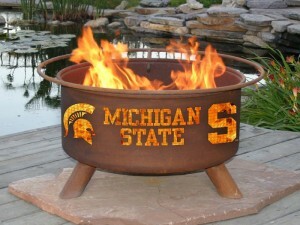 Your choice of college teams and the perfect wood burning fire pit. The natural rust patina finish ages beautifully over time and it is made from cold rolled steel so you are sure to get a sturdy pit as well. 24" diameter bowl that is 12" deep with the outer ring making the overall diameter 30"
Truly a great value for the money and you will feel better about spending the $249 knowing you get the 5 year rust-through warranty, the cooking grate and all the extras and of course, you are showing your team spirit all at the same time! Find your team today!